The generous way in which my story has been accepted encourages me to tell a bit more of the details which ensued over my adult lifetime. It has been a deeply sentimental affair. The Chicago, Burlington, & Quincy Railroad (CBQ; "Q") traversed my little birthplace town, Berwyn, Illinois, from east to west, only 2 miles, with it's 3 mainline tracks. Everyone loved the railroad, even the fretting at crossings while long freights passed through. Towards the end of the Steam Era, 1950s, extreme public interest resulted in Steam Excursions from time to time. One such trip, Chicago to Galesburg (IL) and return, a distance of about 200 miles one way, was scheduled early my Senior year in High School; my Mother encouraged me to take the trip, run on a Sunday with several school chums. It was a "double-header", having two giant steam locomotives, #6315, a huge Texas type 2-10-4, followed by my favorite-to-become #5632, a Northern type 4-8-4, as seen below. Behind the second engine is an old Railway Express Agency baggage car with wide doors agape, with 2X6s nailed across to prevent young fools like me from falling out. I was IN that baggage car when this photo was taken during a "run-by" photo session! I'm hoping the subscript may be legible, the date is Sept. 6, 1959. 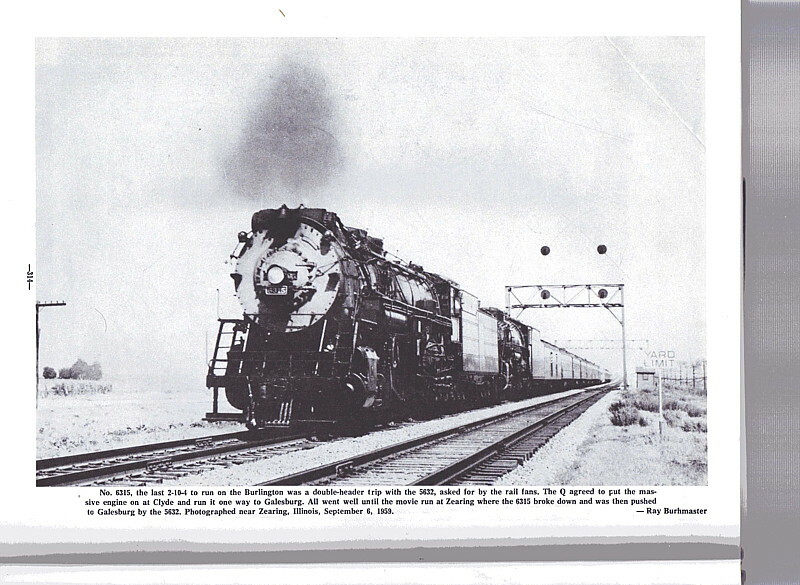 The big Texas broke down before reaching Galesburg, and 5632, behind it, was used to get the entire train moving again, working alone, until a siding was reached, where the Texas was uncoupled and abandoned. That fact alone places that trip in the most historic annals of Steam Excursions! 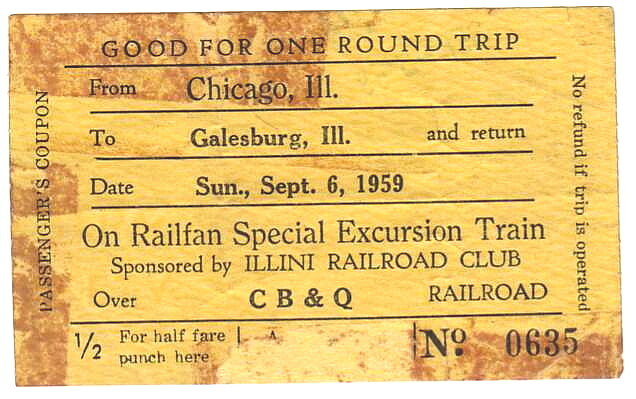 The original ticket from the trip! Note the date! Below, a photo of 5632 shortly after it was built, in 1940. It was one of about 28 which the "Q" built itself in it's shops in Iowa! Note the Fireman climbing the ladder of the cab: those engines were Behemoths! "Chicago, Burlington, and Quincy 5632 was one of the 28 class O-5A 4-8-4s that were built at the railroad's own shops. It was built in 1940 for the Chicago, Burlington, and Quincy railroad. After the end of steam, 5632 was used along with 2-8-2 4960 in excursion service. However, the locomotive was under an overhaul when Louis W. Menk took over the CB&Q, so 5632 and 2-8-2 4963 were sold to Richard Jensen. Jensen was trying to restore 5632 when the Chicago and Western Indiana railroad, which he had rented space at their Chicago roundhouse for his locomotives, went bankrupt and kicked him out. 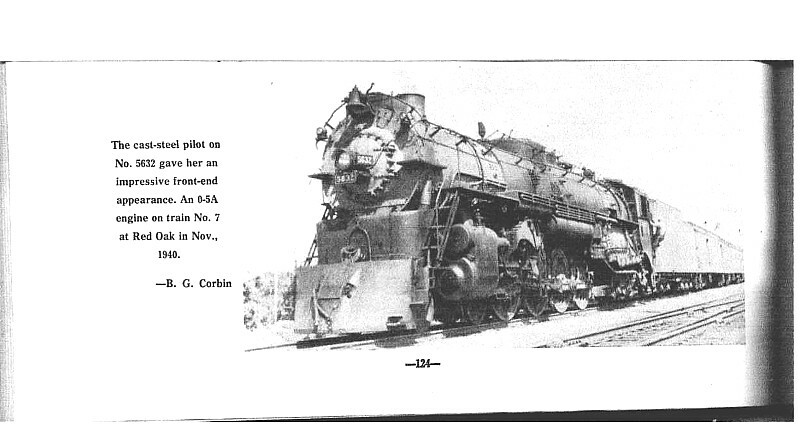 As a result, the gigantic 4-8-4 was moved to a scrapyard. But it derailed while moving into it, and it was scrapped right where it sat." There are some amazing people out there. And some amazing stuff t there. I was at the races a few years ago, it's a country meeting around a small country town called methven. As I drove in I spotted about 30 classic cars parked up, I went over to have a look and a chat, the group were all from this wee town. The guy running it said these cars are normally locked away. You don't realise these cars are about. There are some very clever people out there, I take my hat off to anyone that creative and skilled. Lullabelle and Yorky like this. This is a place called the bay of islands. This is Russell. I'm not named after this place but I do love it up there. We go there every 4 or 5 years. It's in the north island. Pohutakawas every where. Beautiful tree. Pronounced Poe hoota kar Wah. morning glory, Yorky and rascal like this. Heading over the Brecon Beacons yesterday - not for the faint-hearted! I spent some time on the moors of the Brecon Beacons and in February '70. It was extremely cold. SatNavSaysStraightOn and Lullabelle like this. No wonder they look happy daffodils - they've drunk all the beer! morning glory, Yorky and MypinchofItaly like this. Nice pic mg, must be Spring over there? Eclectic book collection! Not my books - I am staying with my friend in Saffron Walden (Essex). Its not Spring yet - we just get imported daffodils from late January onwards. Our daffs appear August here, hagley park (huge park in our city) is full of them. Our city is surrounded by the 4 avenues. These also are full of them as well. People get peed off as a few Asians pinch them and resell them.